fall decorating: front porch finished! 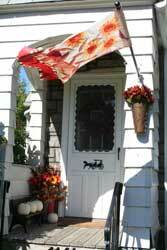 I finished decorating my front porch last weekend, after creating the structure for year-round decorating. As you can see from the picture on the left, our porch badly needs updating. I’m not fond on the black horse and buggy on the screen door, but it would cost several hundred dollars to replace the door which is part of the frame. The wood on the porch floor is very weather-worn with paint peeling off. Whoever painted the aluminum (very bad paint job) got globs of white paint on the fake stone on the side of the house. It’s not a horror story, but it’s pretty darn close. Since I couldn’t change the features I mentioned above until we reside the outside of the house, I decided to focus on what I could change and keep the focus on seasonal accents. First I spray painted the bench and two buckets on the left side of the porch. Then I spray painted the flag pole. I’ve been following the Nester’s advice on collecting realistic fake greenery whenever I hit a major clearance sale at Joann Fabrics and Michael’s. I used to collect lighter colored flowers and greenery until I realized that the more vibrant colors would work better on my porch. I also realized that larger flowers are more eye-catching, and I can get away with using only a few for dramatic effect. In the two pots on the right, I have a mixture of grasses and leaves with maybe five or six sunflowers and one mum-type flower mixed in. 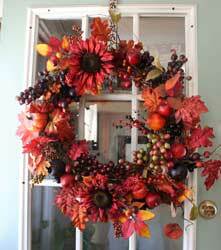 For my wreath, I used sprays of dark-colored flowers and leaves, along with realistic-looking fruit and mini pumpkins. I had a few lighter-colored sprays in my Christmas decorations which I added in to lighten up the wreath. The base for my wreath is a grapevine wreath that I picked up at A.C. Moore years ago. I keep a strand of little oak leaves wrapped around the wreath, along with a few ceramic pears. This time I covered these pieces with the fall sprays. Eventually I would like to spray paint the fake white pumpkins silver, but for now, they look fine on the porch, and they’re safe from maurading squirrels. It’s a Good Thing. I love fall! Your front porce decorations look great! Your porch looks great! 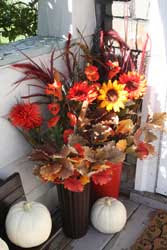 Lovin all the Fall colors you used and the white pumpkins! Now you have a great place to relax and enjoy the weather. Could you paint the horse and buggy white to match the door? That might make it less noticable. Great idea, Coleen! I'll take a look and see what I can do. Thanks again for the wreath bows!